Luck Luckey and Heather Meitner from the CRC provided two-day intensive training. A training session on methods to engage with perpetrators of domestic violence, including holding perpetrators to account for their actions, was held for supervisors and workers in early December. The training, which used a safety organized approach to domestic violence, was provided by Heather Meitner, senior program specialist with the Children’s Research Center, and Luck Luckey, practice coach and trainer with the County of San Diego Child Welfare Services. About 120 people attended each of the two-day sessions. 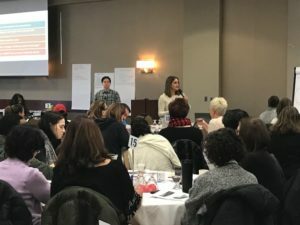 As part of the session, Safe and Together™ concepts were used to help child welfare workers increase their skill in terms of engaging domestic violence perpetrators, using both solution-focused and safety organized strategies. perpetrator’s patterns of coercion and control can cause harm to a child, including negative effects on the other partner’s parenting abilities (depression, loss of authority) and the harm that domestic violence causes to children, including behavioural, emotional and developmental issues. Part of the first day focused on biases that workers may have about perpetrators, including either dismissing him because his whereabouts are unknown or because he has a separate home, or painting the perpetrator as “a bad guy and a monster,” who should be arrested or sent away. Attendees were then asked to come up with ideas to change ways they may have formed biases about perpetrators in the past. which participants were able to role play as both a social worker and a perpetrator using a case study. Discussion was then held about creating a safety plan with the perpetrator, using the SDM (Structured Decision Making)® safety assessment. Attendees were introduced to the six core components of a DV case plan. Over the course of the two days, participants were trained in: engaging with the perpetrator during DV; identifying perpetrator patterns to help use Structured Decision Making (SDM) assessments; using solution-focused questions to interview for danger and safety; and finally, combining all of these practices to create perpetrator accountability and child-centred safety and case plans.